It certainly would not have been my style, either, to "beautify" my bath tub with a shower curtain depicting England's famous red phone boxes. For one thing, the many roommates with whom I shared shower space (not always at the same time) would almost certainly have vetoed such a motion. However, fast forward to 2015, when this veto would finally be struck down by yours truly—all without any input from my current roommate (my wife), who had entrusted me with the task of finding something that "adds colo(u)r" to the bathroom. I made good on that promise, don't you think? Anyhow, in an odd sort of way, this new addition makes my showers feel more like a gentle stroll through a London side street. There's even water coming down from above. So authentic. What are some of your most English of possessions? Let me know in the comments. LOVE the shower curtain! 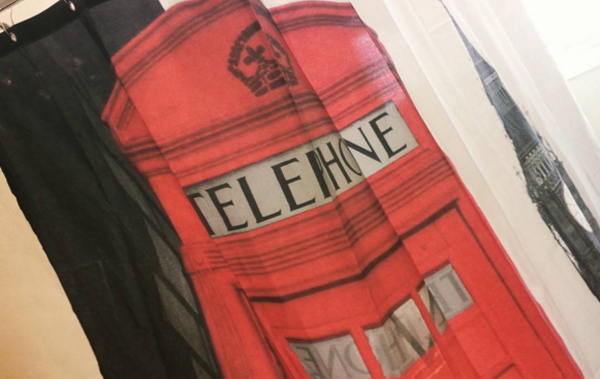 I have some tea towels, and a couple of tea cups with the Union Jack and one tea cup with little phone boxes on it. But, my pride and joy is the electric tea kettle my Husband got me... I love saying.. " Could you put the kettle on?" J-O-Y! I've gone tea towel mad and I have a Union Flag pillow in my formal living room and one in our bedroom. You see the American flag everywhere, I needed to see mine too!!! I also have two Emma Bridgewater flag tea caddies. I have tons... A bona-fide collection. We moved recently, and I haven't yet decided where, in the new digs, i will display it all, so it remains packed away. But it's a borderline sickness. I love it. This is brilliant, I'm glad I'm not the only one this has happened to...we have a Union Jack door mat, tea towel, sofa cushions, fridge magnet and oven glove. I had an awkward moment recently at a party when two American men in their forties both asked me 'What is the Union Jack? ', after answering them in wide-eyed bemusement one even googled it to check I was telling the truth!!! Can't do the flag, but instead of 3 ducks on the wall I have 3 different sized marmite jars on the shelf, my kids think I am so sad!!! I have so much however the one which came to mind when you asked is the one I can not display. The poor Golliwog locked away in a wooden box for no one to enjoy! Sad. My husband is from England. My inlaws are all over there still. I have so much stuff to fill my obsession. Doctor Who merch, Union Jack Flag, Xmas tins from M & S, Makeup by Tanya Burr and Zoella, Lush stuff galore. I have lots of snacks and goodies too. I LOVE that shower curtain. That is magnificent! I really want to know where you got the shower curtain, Laurence. I love the shower curtain, Laurence. Looking for one myself, I like that design layout. I use my kettle daily, my Brown Betty teapot, i go through pounds of PGTIps loose tea in a month. I'm very lucky to have a great 'corner shop' just around the corner that keeps me in tea, sweeties, Bisto. And, my paper recycling container is a large Union Jack bag, form and function. An old map of London hangs above the bed, and i carry a couple of pound coins in my pocket every day as a reminder of going home. As an American child of the '60s, I became an Anglophile due to the Beatles and the entire British musical invasion. I've always fancied getting a Union Jack teapot--except that I already own 5 or 6 teapots of various sizes, and really don't need one. I've got my eye on a small Union Jack coin purse recently, as it would be a fine impetus to start saving money for a trip to the UK--and then I could use it for the British currency! That's a brilliant shower curtain, by the way. There's just something about the way those phone booths look that's innately satisfying. I used to have a wonderful red Christmas sweatshirt that featured four large penguins, each in one of those British phone booths. Please let folks know where to order that shower curtain, Laurence--surely the business which sells them deserves the boost as much as your inquiring readers deserve to know? Cheers! We had to bring a gift for the LA Brits meetup Xmas party last year. I found a little metal TARDIS that held tea leaves that could be dunked in a teapot. Wish I had bought one for myself now. I have a Beatles Tee with a union Jack behind the fab 4. No... I'm not going to ask when they will get back together. It's not really a "union jack" if it's not flown on a ship (from the jackstaff), it's the union flag.